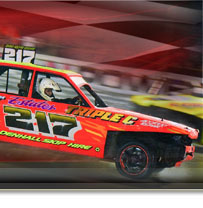 Foxhall International Raceway is situated off the A12 to Yarmouth. The track is a 382 metre tarmac oval and is the fastest and largest track that Spedeworth promotes. The track has a steel cable fence above an armco covered concrete wall. 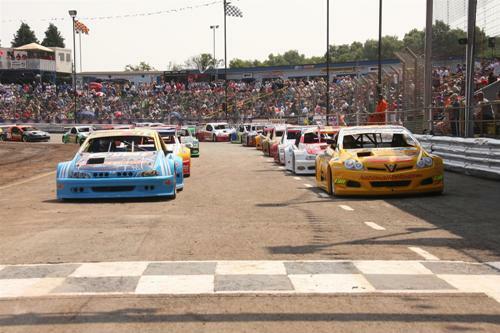 Foxhall Heath is the home to many of the major championships offered by Spedeworth, including the National Banger World Final and the National Hot Rod World Championship at the annual Spedeweekend event. The facilities at Foxhall include a covered seated grandstand and concrete stepped terracing, as well as our 2 new fantastic 1,500 seater grandstands on the back straight. There is first class catering available, a licensed club house, toilets including disabled access and wash facilities, and we are in the process of upgrading many of these facilities too! We have a VIP lounge and raised VIP units with balconies all available for hire and affording an excellent view of the racing. To enquire on availability of these units or with any other questions please call us on 01252 322920. The pits are situated behind the start/finish straight. Racing takes place on Saturday evenings, occasional Sundays, Bank Holiday Mondays and the annual Spedeweekend each July. Fixtures are listed below. The advertised start time is the time of the first race. Doors open at least an hour before the meeting starts, sometimes much earlier for our most popular events. The post code for the track is IP4 5TL. There are also regular Car Boot sales in the car park every Sunday & Bank Holiday Mondays from March until September. It costs £8 per pitch for any size car/van with trailer and admission to the public is 50p or £1 per vehicle. The gates open at 6.00am for stall holders and for the public. Finishing time is approximately 1.00pm. Contact 07570 836466 / 07922 292831 for further details. Toilets and Catering facilities are also available.